Private Carriage House On Lake Cameron Comfortably Accommodates Four People. We welcome you to enjoy the Carriage House at The Waters. The Carriage House has a private entrance and is part of a grand Southern Style home on Lake Cameron. You can comfortably sleep four in a private and luxurious setting. The Carriage House has a fully equipped kitchen, a loft, a cozy bunk room, central heat and air, washer/dryer, three flat screen TV's, wood floors, ship-lap siding and ceiling fans are in every room, making it a wonderful place to spend a weekend, week or month. The first level includes the living room with flat screen TV, dining room, bunk room with flat screen TV, bathroom, and Kitchen. The vaulted ceiling in the living room looks up to the cozy sleeping loft furnished with a queen bed, a flat screen TV. You will find a full size washer/dryer on the second floor behind a hand crafted sliding barn door. 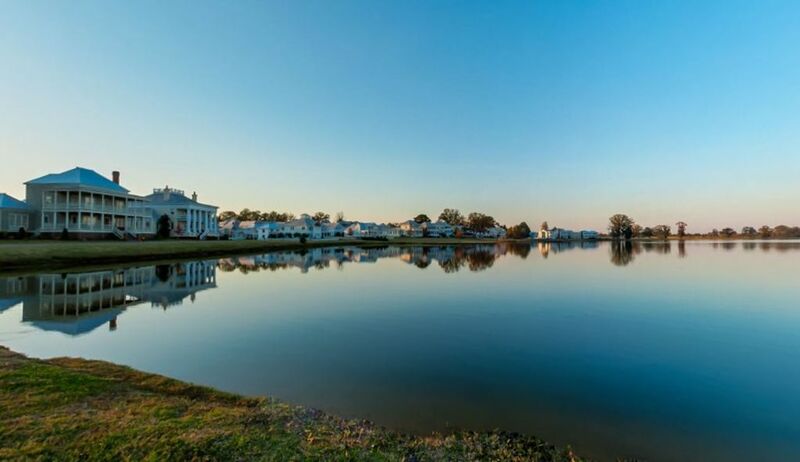 While you are here, enjoy kayaking on Lake Cameron, swimming, tennis, basketball, run around the lake, or a stroll through a Southern Style and picturesque neighborhood. Visit our neighborhood restaurant & market. The Carriage house is built to comfortably accommodate 4 adults but a small 5th person can sleep on the couch. We first found the Waters because we stayed, while on a business trip, in the vacation loft belonging to one of our wonderful neighbors. We fell in love with The Waters as we continued to come on a regular basis and stayed in our friends "Loft" (See VRBO Listing #307240 for The Loft) and in our other wonderful neighbors "Pink House" (See VRBO Listing #670503 for Pink House) for about 18 months when I would come to Alabama, before we finally purchased our home. We originally planned to purchase a second home that I would use as a residence while in Alabama working on various business projects but we found a home and a neighborhood that we just could not stay away from. We still have homes in other cities, but this is where we live most of the time now. We designed and remodeled the Carriage House to combine modern amenities with an old style "horse and buggy" cottage. Our Carriage House has many modern conveniences and decorated to feel like an old style horse and buggy Carriage House. It has a brand new kitchen with all new appliances. Very comfortable queen bed in the loft and cozy comfortable bunks in the Bunk Room. There is a brand new full size washer and dryer inside of the Carriage House behind an old style sliding barn door. Our guest will enjoy beautiful views of Lake Cameron and many opportunities to enjoy a wonderful and memorable experience. The Carriage house is private with a separate entrance, but we are not far away and we will attend to making your stay comfortable and relaxing. The carriage house overlooks Town Square on one side and Lake Cameron on the other. Kayaks, Canoes, life vest, paddles. Yoga Classes are held on Sundays and Tuesdays $10 per class See link below https://www.lifespringfitness.net/flow-yoga Daily House Keeping is available at additional cost. Private Chef available at additional cost (preset menu options). Baby sitting available at additional cost. Transportation available at additional cost (must be scheduled). This was a precious little place! Perfect for 2 to 4 people. This is the best VRBO/HomeAway or Airbnb property that I have ever rented. The owner thought of everything including a golf cart to explore the grounds. This home was at the perfect temp, kitchen and bathroom were stocked, and truly felt like a home away from home! Thanks Daniel and Scottie! Couldn't have enjoyed our stay more. The community where it's located is fabulous...I like that it's tucked away a bit, but It's also not too far from nice restaurants and shopping. We were provided with everything we could need and more. It was nice just to walk around the lake/neighborhood with our little one and then have a nice quiet place to go back to. Everything was clean and well kept, and I'm a germaphobe so I greatly appreciate how nice it was! We are booking it a second time on our way back through town. I would definitely recommend staying here! We stayed here while on a long trip, just to mix it up. It’s only 1/2 hour outside of Montgomery, and it was the perfect change from chain hotels. Staying here allowed us to enjoy the gorgeous grounds, lake and pool for several hours before we hit the road again. It was its own destination. At night, we rode the golf cart around for a scenic and relaxing ride and a taste of Alabama. The unit is amazingly equipped. Pretty much, anything you can think of is there - just like visiting a friend’s house. Daniel met us and was very helpful and generous and accommodated some requests. There’s a cafe with very nice owners within walking distance - or 2 mins on the golf cart - and we were able to eat meals there, buy wine, etc. Also, this unit in particular is nice because essentially right at the water (not up in the “town”) and so makes the experience. I’d definitely return. It’s a great option to stretch the legs and fit in a different “destination” on a trip! If you’ve got time to spend a few extra hours or the day there, it’s worth the extra $ over a hotel.